lhb1142 called them "most beautiful" the wallpapers of MX-LINUX. revisit and stomped out the 16 on a good one. "beach-rocks-resco-of-1812-"
always like using this machine. set-up with mx. 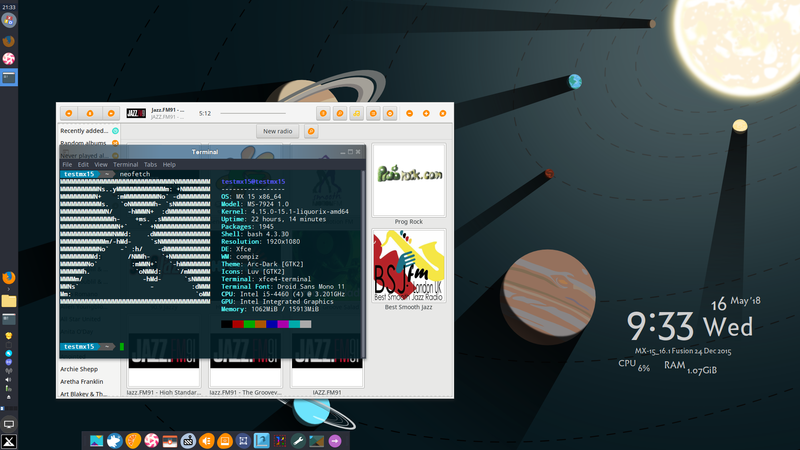 xfce. to grab the appropriate logo to add as an overlay to the rocks wallpaper. IIRC, this manipulated picture was taken by an uncle or friend of Dev Team's Paul..
and Paul.. for this exquisite wallpaper is one of the "most beautiful" as that referred in posts about MX-Linux backgrounds. Sorry wrong place. I can't work out how to delete posts. So this will have to do... doh! Icons: Paper, with Moka as the "inherits" fallback. 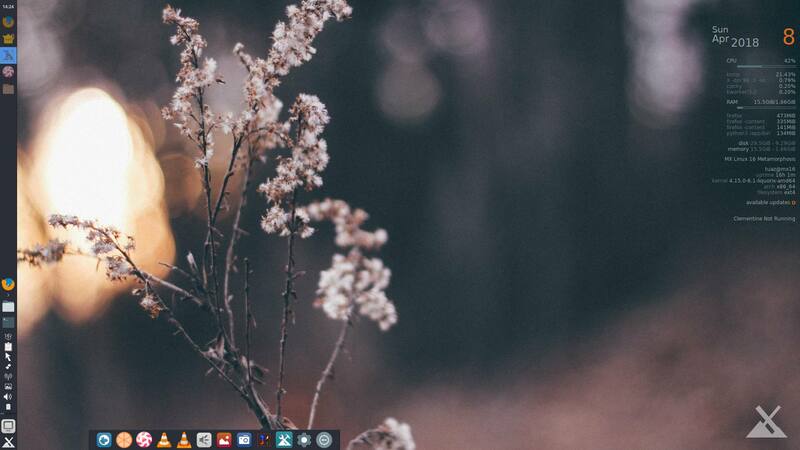 conky: modified from something in mabox (spin of Manjaro) but with a clementine script added and the "available updates" script changed to reference aptitude rather than pacman. Doesn't work perfectly though because after you install updates, the conky status will still show updates as being available and won't change during the current session. A Google search seemed to indicate that you can't get it any more updated without using elevated-privileges commands. candidate for the MX-16 default--I love the very unusual colors. BTW: I can't quite make out the conky, can you please post a close-up? Here it is with Clementine running. It works but not for themeing. No matter what gtk theme you apply, flatpak Lollypop will just show up in standard Adwaita theme. Also, some radio channels won't work with the opml way of describing the web location (I suspect gstreamer is too old in Jessie). You may need the full URL address which you can ascertain by copying the opml location in Lollypop and then running the opml location as a network stream in VLC (which always works!). Then go to VLC's menu>>tools >> media information and look for the URL address at the bottom of the window. Icon set is an old version of Luv but with uniform+ as fallback.